The often used Japanese Maple tree by the front entry, thoroughly enhanced and contrasted with perennials. Hemerocallis ‘Just Plum Happy’, my favorite daylily that blooms from June to August. In the shady background is Carex ‘Bowles Golden’ used for a light in the dark and a great textural feature. Boxwoods are the supporting actors under the windows. My career in horticulture began in 1989 with the inception of my perennial plant nursery, but my experience in design started two decades prior to that in the fashion and home-interior industries. As a fashion merchandiser, I would look at our entire women’s sportswear department and its thousands of clothing items, decide what pieces went together to best illustrate the current trends, create the displays to sell the outfits, and arrange the department to make it easy for customers to purchase the merchandise. My displays had to deliver the fashion trend message in the few seconds it took for shoppers to walk through the department. They might buy only one or two of the items in the display, but they would also know how to update their own wardrobes for the coming season. Later, my career turned to interiors. I designed model home interiors to show customers shopping for new homes how to use colors and textures in upholstery, window treatments, and accessories to update their own homes. A living room may have a sofa and a couple of chairs, but the sofa will almost always be the focal point because of its size alone. Shapes and proportions are coordinated and pulled together using color, and accessories accent the style. My switch to garden design proved to be amazingly easy, as I found that basic design principles were a common thread running through my career choices. There are always focal points, all-important color combinations, accent pieces, and accessories that pull the whole look together. Designing a garden can be much like assembling an outfit with the right shoes and earrings, or pulling a living room together with pillows and accent chairs. Whether I was planning a flower garden or adding perennials to foundation plantings, the same principles apply. Unfortunately, fashion, interiors, and gardens can all be fraught with common design perils. Have you ever purchased a pair of earrings and found nothing in your closet to go with them? Even worse, have you brought home a great new chair that doesn’t go with anything else in your home? I’ve worked in garden centers, and watched as enthusiastic customers fill their little wagons with a variety of exciting new plants, only to discover that they had no clue where they would plant them, or if they would go with the plants already in their gardens. design will prevent costly mistakes and help create the look you’re after. If you are a plant addict like me, you still may purchase plants on a whim, and you can always leave space in your design for impulse buys and experimental plants. 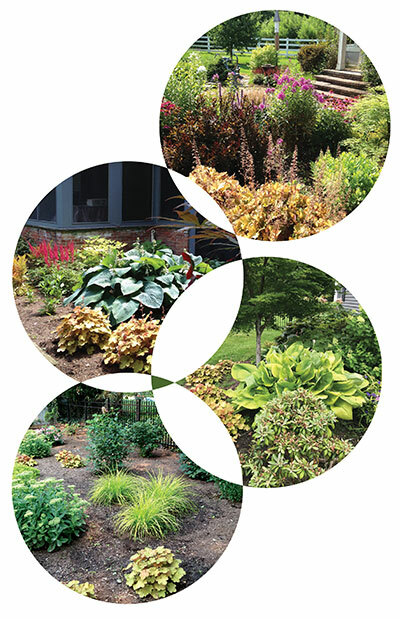 In your landscapes, combine plants so that they enhance each other, and bring more visual bang for your buck. You can also use this technique to draw the eye to the area you want to emphasize, or to feature a special plant you love. So, as with many things in life, having a plan is the place to start. Here is how I formulate my garden design plans. Start by listing the trees, shrubs, and perennials you think you want to use. Sunlight requirements, size, shape, color, texture, and four-season habit of each plant. In landscape design, a tree (like a sofa) is usually the focal point because of its size, but also it can accent architectural features of the house, including entryways and windows, especially if they’re smaller trees like Japanese Maples or Dogwoods. In a garden, shrubs can be focal points because of size, so choosing the right shrub for its size, bloom time, and color will make it a working focal point as you put perennials around it. Shapes and sizes play off each other. Spiky, round-mounded, vase-shaped, column-shaped, and random viney are just a few examples. Planting in numbers is near the top of the list of important design techniques. Threes and fives are the numbers I use to allow for massing for effect, and wrapping plants around others for shaping or edging the group. Mostly we buy perennials for their flowers, but they don’t all bloom at the same time, and some bloom longer than others. A few perennials bloom all season, so I use those as the anchors of my designs; plants like Geranium Rosanne, Becky Daisy, Hybrid Coneflowers and Garden Phlox. What do the plants look like when they are not blooming? Do they have a good sustaining foliage? Great foliage color? Textural features? A stunning flower that will make up for the lack of other features so we will stick it in the middle? Will it be a specimen (standalone) or does it need to be planted in numbers? My goal in designing front landscapes is always to stop traffic – the same goal I had when creating fashion displays. The backyard garden can be more for personal enjoyment, though there’s still nothing wrong with increasing the pizzazz in any garden. How the plants combine with each other will always bring more value to each plant, and thus increase the pleasure factor of the entire space.